"Home Sweet Home Bring Your Clothes"
Size: 1,300 sq. ft. "m/l including Lanai"
As soon as this seller found out she won’t have to cook or clean if she moves, she furiously started emptying closets and cabinets and found a moment to call me. Says she doesn’t mind a bit leaving the new laminate flooring, new A/C, new side door, new refrigerator, new dishwasher, or new washer and dryer set. Located in friendly Buccaneer Estates this 1980 TWIN with a roof over could be yours with park approval. With the glass windowed Florida room, total square footage is over 1,300 sq ft. This home is cozy and comfy with BIG WALK IN closets. Will be furnished with the exception of the pink bedroom, electronics, wall décor, and personal items. This home has a NEW roof-over, NEW electrical panel, NEW air conditioner, NEW water heater, and NEW washing machine. Lot rent is approximately $738 and includes lawn care and use of all amenities. Other fees are a pass-on tax, water, sewer, trash, and add approximately $100 to monthly expenses. Utilities are electric through LCEC and cable with Comcast/Xfinity. 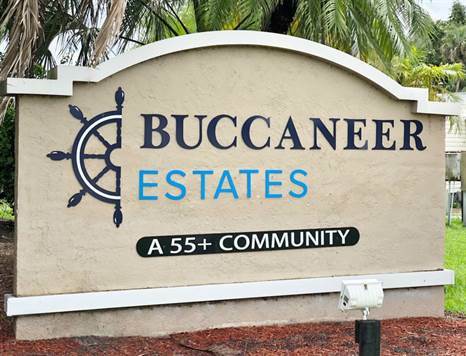 Buccaneer Estates is loaded with amenities TWO swimming pools, sauna, hot tub, laundry mat, clubhouse, hospitality house, exercise rooms, horseshoes, shuffleboard, billiards and activities coordinated by the residents. This location is close to medical and municipal services, as well as HISTORIC DOWNTOWN FORT MYERS, FL, SANIBEL and CAPTIVA ISLANDS, FORT MYERS BEACH, EDISON AND FORD WINTER ESTATES, SANIBEL OUTLET MALL, BELL TOWER SHOPS, MIROMAR OUTLETS, GULF COAST TOWN CENTER and MUCH, MORE. Information is deemed to be correct but not guaranteed. Young Realty Group Inc.
©2007-2019 Young Realty Group, Inc.